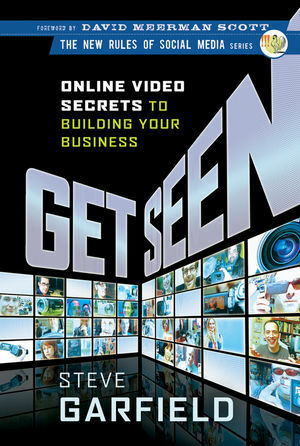 We are introducing our July Book of the Month, Get Seen: Online Video Secrets to Building Your Business by Steve Garfield. This well written and very textbook like read provides readers with great tips for getting video on the web starting with recommended tools like cameras, the proper lighting and editing. Garfield references popular examples of the use of video to build buzz. He was able to land a short interview with Jimmy Fallon, who explained how he used video blogging and Twitter to build awareness for his late night talk show. In an effort to continue discussion and connect our Social Media Club community with our featured Book Club authors, we are hosting a complimentary webinar on Wednesday, July 27, 2011 at 2pm EDT with Steve Garfield, Author of Get Seen. As a Social Media Club Professional Membership benefit, we are inviting Professional members to be part of our Social Media Book Club. If you are a Professional Member and interested in receiving, reviewing and sharing your feedback with the rest of the SMC community, please email Jessica [Jessica at socialmediaclub dot org] for details. The Social Media Book Club will feature social media’s most innovative thought leaders, who have written books that can help our global community learn, improve and share. We have selected several titles we will be introducing to you at the beginning of each month and have asked several of our Professional members and chapter leaders to help us review the monthly titles. Social Media Club officially launched a monthly book club in March 2011, and has already featured titles such as, Wikibrands, Content Rules and Curation Nation, with complimentary webinars made available to our SMC community. To purchase your copy of Get Seen, visit Amazon. *Disclosure, this is an affiliate link and Social Media Club will most likely earn $0.02 if you order this book. Think of it as a way to help fund our media literacy programs! Be sure to follow the Social Media Book Club hashtag on Twitter, #smcbooks.